Sweet potatoes are full of wonderful vitamins, are alkaline and help reduce blood sugar. You can enjoy them several times a week cooked in various ways. They're versatile enough to be in a stew, curry, veggie patty, side dish or served on their own or in a dessert. I modified this recipe I found online. Avocado or Olive oil for baking sheet. Steam sweet potatoes in their skin, covered, until soft. Do not boil, as they lose flavor and will be too mushy. Remove potatoes from pot, peel and mash in a medium bowl. Place 1/2 the beans in food processor and blend. Add all the beans to the potatoes. Add the garlic, onions, parsley, cilantro, and spices. Stir together to combine. Stir in the lime juice, zest. Form mixture into 8 patties, just under 1/2" thick. Place patties on oiled baking sheet. Brush tops lightly with olive oil. Bake for 12 minutes, flip carefully and bake for another 10 minutes, or until lightly browned. Serve topped with a fresh salsa (tomatoes, onions, cilantro, cucumber, lime or lemon juice and 2 Tbs. plain almond or coconut yogurt), or enjoy in a high-fiber gluten-free bun with condiments. Food coloring lives on a very high shelf of my cupboard, awaiting its once a year service as dye for boiled eggs on Easter. Natural, edible, safe food-based coloring is thankfully available, but I enjoy making my own too. Drain liquid from coconut cream. Place cream in mixer bowl and beat on medium speed until fluffy, about 6 - 7 minutes. Add mashed banana, and the rest of the ingredients. Beat for 2 more minutes until well mixed. Top with berries, cover tightly and refrigerate for at least 1 hour. Cut into square and serve with more berries if desired. Here is a salad that I accidentally created today when I was trying to finish off some leftovers... it turned out to be amazingly Delicioso! 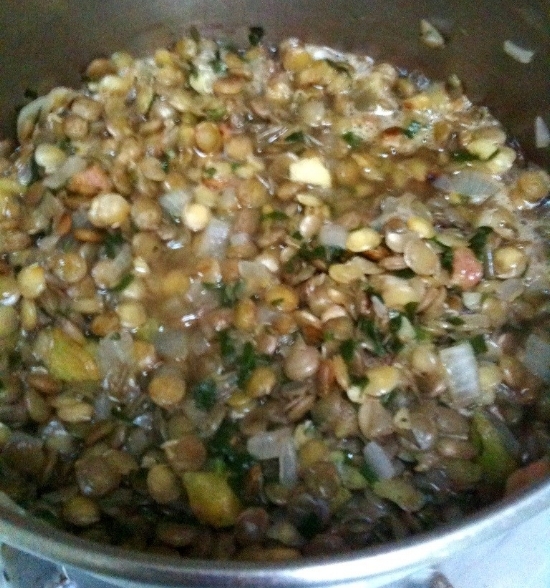 Yesterday I cooked some sprouted lentils with onions as a quick version of Mjaddara(The Lebanese Lentil Mash dish). The sprouted version hold their shape much better, so not really as creamy as Mjaddara, but still very tasty. Place medium size pot over med heat for 1 minute. Add onions and saute for 2 minutes stirring occasionally, until lightly brown on edges. Turn heat to med-low. Add olive oil and rice, stirring for another 2 minutes. Add water, cover and simmer for 25 minutes. Add lentils and salt, stirring to mix. Cover and simmer another 10 - 15 minutes, until rice is done and the water absorbed. You may need to add a little more water after adding lentils if too dry. There should be enough water at that point to soak but not cover the lentils. Taste, and adjust salt seasoning. Combine the two Salads in any ratio that pleases you. There are some days when I get an awfully strong craving for Indian spices. I either want to have a curried dish, or a lentil dish... those are the two competitors for my attention. My favorite dish when I was a girl, is called Mjaddara, a 'peasant' type winter dish popular in the villages of Lebanon. It's basically a lentil/rice/onion mash that is sooo tasty, sooo comforting and sooo healthy! That's THREE Soooo's!! :) Mom was an expert Mjaddara maker, like her father. "Aside from their slight differences in calorie, carb and protein values, red and French lentils have very similar health benefits. Both are protein-rich, plant-based foods, which gives them a unique set of positive nutritional properties. According to ChooseMyPlate.gov: low-fat proteins such as lentils are essential for growing, building, repairing and maimaintaining tissues in blood, skin, bone and muscle cells. Protein is also a particularly satiating nutrient and may be able to keep you full for longer than carb- or fat-rich foods, which can be important if you’re watching your weight. Both red and French lentils are high in dietary fiber, which means they can improve digestive health and potentially lower levels of blood cholesterol and blood sugar." 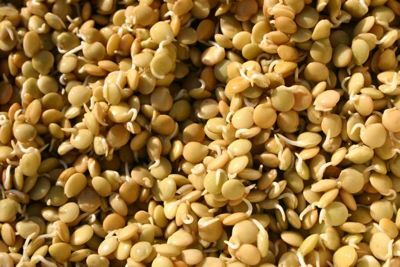 Mung beans are low in Saturated Fat and Sodium, and very low in Cholesterol. It is also a good source of Protein, Thiamin, Niacin, Vitamin B6, Pantothenic Acid, Iron, Magnesium, Phosphorus and Potassium, and a very good source of Dietary Fiber, Vitamin C, Vitamin K, Riboflavin, Folate, Copper and Manganese. Add a zero to the total grams of fiber per serving, so 2g becomes 20. Compare it to the total grams of Carbs per serving. The fiber number should be MORE than the total Carbohydrates number. This means if a product has 20g of Carbs and 1g of Fiber (i.e. 10) Then put it back on the shelf!There is not enough fiber to slow down the conversion of the carbs into glucose, and it will spike your blood sugar. These spikes that occur all day long are what predispose us to Diabetes and other diseases. Aim for at least 1.5 times the Fiber to Carbs. 1 cup of cookedMung beans has 2 grams of Fiber vs. 6 grams of Carbs. That's 20 vs 6! A very good ratio. 1 cup of Lentils have 16 grams of Fiber vs. 40 grams of Carb...160 to 40! An Excellent ratio. And of course we know that a diet high in fiber can help prevent colon and breast cancer. So eat your beans! I adapted this recipe to include both lentils and mung beans. Heat a medium stainless steel pot over medium heat for 1 minute. Add oil and wait another 1 minute. Add onion and chili pepper and saute for 2 minutes. Add ginger and cilantro, stirring for 1 minute. Add beans and spices and 1 cup hot water, stir, cover and simmer over medium-low for 15 minutes. Press one of the beans between your fingers to make sure they are done, and add the last 1/2 c. of hot water if too dry. Adjust seasoning, and serve hot or at room temperature. I had an appointment with my anthroposophic Doc in San Francisco yesterday. I've been having vertigo that lasts for a few seconds when I lay down, and inner ear congestion, so I sought her help. She is an amazing woman with more accomplishments than I can ever remember. J and I drove in 4 hours early since he had a meeting on Haight Street with contractors bidding for a remodel on a new building his boss purchased to turn into another Music store. I hadn't been to Haight in a number of years. My niece and I used to go to a Middle Eastern restaurant across from the building where J has his appointment, to enjoy the food and belly dance to live music. Everyone knows that one aspect of San Francisco's charm is the wonderful Victorian architecture. The intricate designs and eye-catching colors never cease to please me. Haight Street is best known as the principal street in San Francisco's Haight-Ashbury district. The Haight-Ashbury district is famous for its role as a center of the 1960s hippie movement. College and high-school students began streaming into the Haight during the spring break of 1967. Hunter S. Thompson labeled the district "Hashbury" in The New York Times Magazine, and the activities in the area were reported almost daily. I'm sure we all remember the Summer of Love, the social phenomenon in the summer of 1967, when about 100,000 people converged on the Haight-Ashbury triggering a major cultural and political shift. The 'Peace Cafe' located in the Red Victorian, is neighbor to a Vintage Costume and Rental store. We got ourselves something to drink from a cafe across the street, decorated with huge paintings on canvas based on "The Wind in the Willows". Back at home, I decided to roast some veggies, bake some Cod filet with ginger and green onions, and steam Butternut squash with a hint of coconut oil, salt and pepper. For a salad a Slaw with Red and Napa Cabbage. ~I only use veggies that are Organic. Pre-heat oven to 425ºF ; 220ºC. Combine veggies in a large bowl with tea leaves. Add Olive oil and toss to coat thoroughly. Sprinkle with Sea Salt, Black Pepper, Caraway and Cayenne. Toss again until evenly coated with the spices. Spoon Veggies into a large ceramic or glass baking dish that has been lightly sprayed with Coconut or Olive oil. Roast veggies for 30 minutes, toss them with spatula and continue to roast for another 10-15 minutes or until carrots are tender. Adjust seasoning, and serve hot. Giant Lemons Rain Down on California Homeowner! I have two lemon trees and an orange tree in the back yard along the fence. The regular lemon tree has grown 5 feet above the fence, almost dwarfing the orange tree next to it, which in turn dwarfs the Meyer lemon next to it. A few years ago we notice an unusual phenomenon with the regular lemon tree. First of all twice a year we could hardly keep up with the abundant fruit on the tree, and I use a LOT of lemons. We gave many away to family and friends, and i froze some of the juice and made lemonade and lots of our favorite salad dressing. But what we notices was that at the very top of the tree, the lemons grew to be the size and shape of Pomelos (or large grapefruit)! They have the same thick, thick skin, and a tiny fruit inside. The flavor is not the same as the regular lemons.. a little less tart and less juicy! Sometimes they fall off before we have a chance to grab them. From the height of the fence and above, we seem to have a Jack and the Beanstalk type of tree. No one could really explain what was going on, since all the lemons below were perfectly normal. You can see in the photo there are about 4 huddled next to each other, haughtily looking down at the tinier lemons with sour sneers. Last year, J was pruning the tree and he noticed that the giant lemons seemed to be growing on much thicker and thornier stalks that grew from the bottom or the tree. It seems that maybe these are suckers producing the hefty fruits.?? If the tree had been grafted I assume all the lemons would have been the same size. Weird, but the kids love them. J's younger daughter took one to school for show and tell... actually it was show and GUESS! On this mild summer day, what better way to use some of the lemon juice than to dress one of my all-time favorite salads that I invented to get the kids to eat Broccoli! It also gets some cider vinegar in our diet (huge health benefits). In a small bowl combing dressing ingredients, whisking until well combined. Taste and adjust seasoning. Pour over veggies and toss to coat. Note: This is a light dressing, not meant to look like the thicker Slaw dressing we're used to. As a child, eggplants were my least favorite vegetable, much to my mother's disappointment. The only exception was Baba Ghannouj, a must at every Lebanese appetizer table. You see, in the Middle East, the Eggplant is referred to as the King of Stuffed Vegetables due to its versatility and the large number recipes that feature this violet beauty. When I was in my preteen years, I decided that every couple of weeks or so I would force my self to eat one food item that I did not like. When the eggplant's turn came around, it took a while, but slowly I grew to love that little bit of creamy bitterness it offers. Soon my favorite recipes included 4 eggplant dishes... 1) Eggplant rounds pan-fried in olive oil and topped with a Spicy Tomato-Onion medley; 2) Eggplant stuffed with Rice, Lamb, Onions, Tomatoes and Spices; 3) Eggplant-Beef boats with Pine Nuts; and 4) Baba Ghannouj. The recipe below calls for the Caponata to be served cold as an appetizer. Since it is versatile, I have heated it up and spooned it over hot whole wheat couscous that has been cooked in chicken or vegetable broth, for a wonderful meal! Sauté diced eggplant in olive oil until lightly browned; removed from pan. In the same pan, sauté onions, bell peppers, tomatoes and garlic for 2 minutes (vegetables should still have some texture, and garlic should not brown). Mix everything else together in a large bowl with the cooked vegetables. Serve a large scoop of pate over a bed of lettuce and surround with toasted whole wheat pita bread triangles, or scoop onto whole wheat Tuscan bread that has a light smear of Vegenaise. medley bags from Trader Joe (baby kale, baby chard, baby spinach) and decided to create an Asian Style wrap filling using that and a few other ingredients. I had a cup of soaked and sprouted mung beans in the fridge, and about a cup of sprouted lentils that I cooked with green tea, onion, cumin, salt and pepper. So here's what was born from this starter. Pour olive oil into a large sauté pan over medium heat, for 1 minute. Tilt pan to spread oil a little. Add onions and saute for 2 minutes, then add greens and carrots. Stir for 5 -6 minutes or until greens turn bright. Add Mung beans, lentils and water. Stir to mix. When it starts to simmer, turn heat to Low, cover and cook for 10-12 minutes, stirring occasionally. Add ginger, and all seasonings. Stir well, cover and simmer for another 10 minutes, stirring occasionally, until kale is tender. Add a little more water if necessary. Serve wrapped in wilted Chard leaf, whole grain Tortilla, or open face on whole wheat Pita bread. May also be served on top of wild rice or mixed in with buckwheat noodles! 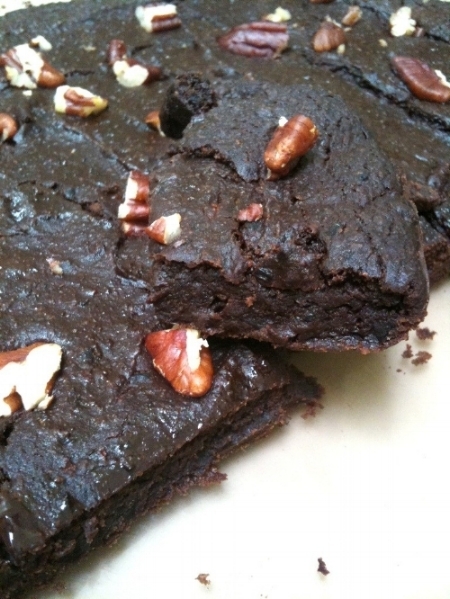 Black Bean Brownies - Revisited! On June 5th I re-blogged the Black Beauty recipe from Chronicles of Passion. I said that I would post the results after I tweaked the recipe to fit in with our Anti-Cancer Diet. Well, I baked up a batch last week, and below is the end result presented in photo and words. Then I followed the recipe instructions for the most part. Preheat oven to 375º F. Line an 8×8 inch pan with parchment paper and set aside. Place beans and banana in food processor and pulse until completely mashed. Add the rest of the ingredients and process until combined, scraping often. Pour batter into pan, spreading it evenly, and push pecan pieces into batter. Bake for 22-27 minutes, or until edges curl away from paper. The brownies may seem a little gooey, but they harden as they cool. Let cool on a rack and slice into squares. I spread a little sugar-free (no artificial sweeteners) raspberry jam on my slice.. and oh my gosh.. it was amazing. By the time J and I finished tasting them, 1/3 of the pan was gone! I liked them cold out of the fridge the next day. Do try this, and tell me what you think! I'm sifting through my Hot Weather recipes to gather them for reference in the upcoming weeks of Summer. Fruit is the main feature in a number of tasty meals I am planning for many reasons... its nutrition content, its ease of preparation, its tastiness and its cooling effect, not to mention the gorgeous colors it brings to our table. I replaced the dairy I used to use with Tofu here. It's possible to serve this without the topping, and just sprinkling the mint on the fruit. Watermelon and grapes have high sugar content, so don't overdo those two fruits. Also make sure you bananas are firm and a little on the green side, since they too are overly loaded with sugar when ripe. In a bowl combine Vegenaise, lemon juice, and Stevia; stir well and set aside. In a large bowl combine fruit, and spoon into serving dishes. Mix Tofu with mint and divide among dishes. Serve with the dressing. is an unprocessed, short grain, that is purplish in color. It is also referred to as forbidden, sticky or sweet black rice. Black rice also contains many essential vitamins and minerals. 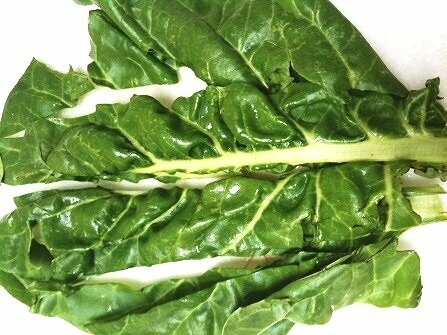 It contains high amounts of vitamin E, a fat soluble vitamin with antioxidant properties. 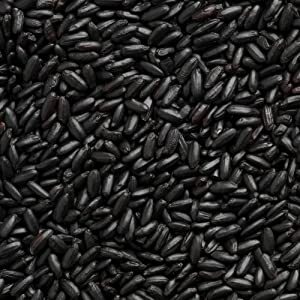 Like most whole grains, black rice is a rich source of the B vitamins. Chronic inflammation is associated with diseases such as heart disease, rheumatoid arthritis, Alzheimer's disease and many others. Black rice bran may help reduce inflammation. I haven't priced this rice at Whole Foods yet, but 6 15-oz packs from Amazon are around $22 (so about $4/lb). Good-Carb formula:Multiply total fiber per serving by 10. The resulting number should exceed the total Carbs per serving. The higher it is than total carbs, the slower it will break down and the less it will spike blood sugar. But due to its antioxidant benefit, you can allow yourself a 1/4 c. a couple of times a week. Cook with coconut oil and chopped veggies, or eat with a protein to further slow down the glucose effect. OR for a treat, make Mochi Balls! Preheat the oven to 325ºF, 170ºC. Soak rice in water and coconut milk Then put in blender, bit at a time, processing until all is well blended. .
Pour batter in to a metal baking dish lined with foil, and then with parchment paper. 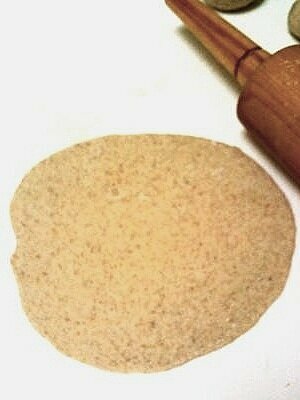 Grease parchment paper with coconut oil. Top with another greased sheet of parchment, so it's touching the batter, and another piece of foil right against the parchment so they are touching. Let Mochi cool for an hour, then remove from pan inverting onto a surface dusted with potato starch. Be careful as Mochi will be super sticky. Form into balls with filling of your choice, or cut into tiny squares dusting with potato starch. You can toss Sweet Mochi on cereal, a top no sugar Sorbets, or enjoy as is with Green Tea! Savory Mochi can be added to soups and stews, or filled and enjoyed as a snack. The first couple of times I tried making baked Falafel in our oven, they were just OK. They dried out a bit more than they should have, and weren't as crispy as I like them... even though I brushed them lightly with olive oil. Well, tonight I decided to give Big Boss a try.. and it didn't disappoint! I put the first batch in for 10 minutes at 400ºF, and then flipped them and added another 10 minutes. Hmm, not very crispy. So J suggested we cook the second batch at 425ºF for 10 minutes on each side, and YAY, the edges were nice and crunchy, and the middle still moist. I stuck with Tradition and whipped up Tahini Sauce, and sliced some organic tomatoes, onions and pickles to go on top. Steamed broccoli, broiled chicken and baked Mac 'n Cheese for the kids completed dinner. Tahini is a source of healthy fatty acids, containing 60.1 mg of omega-3 fatty acids and 3.421 mg of omega-6 fatty acids. Your body doesn't manufacture these fatty acids, so getting them from the foods you eat is critical and they are beneficial for your brain and heart. Thiamine : Consume tahini to boost you thiamine intake. Each serving provides 16 percent of the daily suggested intake of this vitamin, also known as vitamin B-1. The thiamine in tahini influences your nervous system, muscles and digestion. 1/4 c. + cold Water, enough to give sauce the consistency of Ketchup. Pour lemon into garlic and salt mush, and stir well. Add to Tahini sauce along with 1/4 c. water. Stir. Tahini will thicken first (due to chemical reaction to lemon juice. Keep stirring and adding water in 2 Tbs. increments until consistency is reached. Add parsley and stir. Will keep for 1 week in refrigerator. Serving Ideas: Use on Falafel, Fish, as a topping on Steamed Veggies, or as a spread on Baked Eggplant and Tomato sandwiches. Luckily there is enough left for lunch tomorrow! Our city has 4 lovely public parks, each with its own unique character and attractions. Our family is large..( 2 of my siblings live within a mile of me) so between our 9 children and their significant others, and children we're about 28 people. When we all get together it's often outdoors! Being blessed with a family of excellent cooks, potlucks have less to do with luck and more with certainty! The certainty of tasty dishes from everyone. Below are 3 additional Summertime Recipes for your files. I chose ones that don't take a lot of prep, and that are full of the Fantastic Foods you want to incorporate into your daily diet. This recipe can be made several hours before and refrigerated. Take it out of the refrigerator about 30 minutes before serving. Combine tea and quinoa in a medium saucepan, and bring to a boil. Reduce heat, and simmer, covered, for 10 minutes. Remove from heat and let stand for 15 minutes. Then transfer to a large bowl. Add mango, onion, cherries and parsley and mix well. Combine liquid ingredients with spices and whisk until blended. Pour over quinoa, and mix. Reserve 1/2 c. of dressing. Place chicken in large resealable plastic food storage bag. Pour remaining dressing over chicken. Seal bag, and marinate in the refrigerator for 30 minutes. Heat oven to broil, or prepare barbecue grill. Remove chicken from marinade. Grill or Broil 10 - 15 minutes or until center is no longer pink (165º F). Arrange greens on a platter. Slice chicken breasts and arrange over greens. Tops with nuts, coconut and bell pepper. Serve with reserved dressing. This high protein salad has less than 2g. of fat per serving, and a whopping 11 g. of protein. Mix dressing ingredients in small bowl, whisking till blended. Pour over egg mixture. Chill for 30 minutes. Serve on lettuce leaves, whole grain crackers or on Gluten Free or Whole Grain organic bread. Luscious! 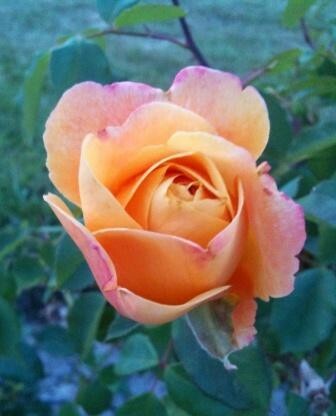 That's the best word I can think of to describe the fullness of color bursting from rosebuds. A promise of even more delight when it reaches full bloom. Flowers lift the energy in a room. And you don't have to be an expert at floral arrangements. Romance yourself with flowers. Don't wait for an occasion to buy or clip some from your yard. And don't wait for someone else to gift you flowers. Order a weekly bouquet. And while you're shopping for the flowers, pick up a couple of ruby grapefruits, two limes, a container of alfalfa sprouts and some grated coconut! After arranging your flowers, sit down to a refreshing tropical salad. This deceptively looking light salad is quite filling. You may serve it on butter lettuce leaves for an even more elegant presentation. The recipe serves about 4. Toast coconut in a dry skillet over low heat, stirring constantly, for about 3 minutes or until golden brown. Transfer to a bowl. Add Tamari sauce, lime juice and water to the coconut and mix well. Heat olive oil over medium in a saute pan for 1 minute. Add garlic and onion, and stir until softened. Remove and discard garlic. Add onions to coconut mixture. Arrange grapefruit segments among 4 plates. Sprinkle each with alfalfa sprouts and spoon the coconut mixture on top. Just had to reblog this! Please substitute Maltitol syrup for honey, and Xylitol for the sugar to conform to our Anti-Cancer diet. I am about to try these! Let me know if you do, and how you like them. Turnover a New Leaf? Make it Swiss! Pierogi (Polish), Kulebyaka (Russian), Steak and kidney pie (British), Zwiebelkuchen (German), Tourtière (French Canadian), Banitza (Bulgarian), Kreatopita (Greek), Fatayir (Lebanese). Click on titles for recipes! My favorite Lebanese turnovers or pies are: Spinach-Onion, Swiss Chard, Chickpea-Onion, and of course Zaatar (Thyme) Pies. Note: Only trim 1 inch off the bottom of the stems of any green. There are nutrients in the stems that may not be present in the leaves! This will alter the amount of greens you wind up with, so I wanted to share that with you. Make 1 recipe Basic Dough and let it rise for 90 minutes, or until about doubled. Stack 3 leaves of Chard and slice lengthwise into 3 - 4 pieces depending on width. Chop and repeat with rest of leaves. Place in a large bowl. Add Spinach. Chop onions and add to greens. Sprinkle Salt over mixture and using your hands mash all together squeezing the greens and onions until slightly wilted. Add lemon juice, sumac, walnuts and olive oil, and mix well. Taste and adjust seasoning. Tilt bowl so liquid will drain on one end, propping with a cloth underneath. When dough is ready, roll into balls the size of walnuts, dipping the bottoms in flour and putting aside. Sprinkle flour on your board or counter top, and roll each ball into a thin round using a little flour if sticky. Place 2 Tbs. of filling in center of round. Make sure liquid is squeezed out. Have a small bowl of water nearby. Dip your finger into water and rub around perimeter of dough round to wet. Fold 1/3 dough over filling, sealing top tip securely by pressing. Fold other 1/3 overlapping the first and press to seal all along overlapped edge. Bring bottom 1/3 up and press along seams and tips to seal well. Place on baking sheet, repeating until all dough it used up. P.S. If you are left with any dough balls, allow to rise for 10 more minutes, and pop in the oven to make into Pita bread! Bake turnovers for 15 minutes or until bottoms are golden brown. Cool to room temperature. Enjoy warm or cold. The planting continues in the side and front yard. I spoke of my grandmother's hydrangea in my Flower Patch post, and how huge and bountiful it's huggable round flowers were. When I went shopping this morning I was greeted by a full display of flowers at the front of the market. To my delight, there on the top row, huddled together, were hydrangeas in several shades. Below them cheerful daisies and mums. I smiled back as I walked past. I made my way to the refrigerated section that carried dairy alternatives, and picked up a block of Almond Cheese and a block of Rice Cheese. Then to the produce aisle to fulfill a lunch craving...some organic spinach, organic Roma tomatoes, and then a couple isles down for some black kalamata olives. I completed the rest of my shopping and headed home on this 82º day in the valley. The hills are beginning to turn yellow as we say goodbye to rainfall until October. Of course with the unpredictable weather patterns of the 21st Century... who knows... they may surprise us and flash green once more. I like the contrast. The evergreens stand out against the hay colored hills, and Mount Diablo stands ever majestic looking over us, lending its protective energy to life here. It's a little after noon when I get home and unpack the groceries. 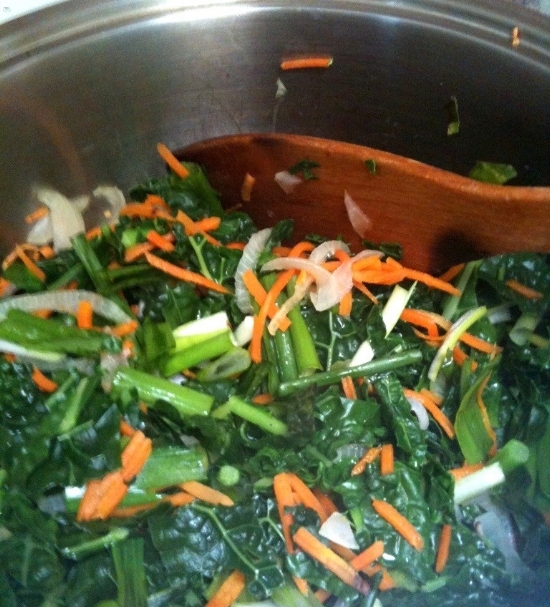 I am going to make Swiss Chard Turnovers for the week, so I chop and blend the ingredients for the filling. (Will post recipe for these delicious triangles later). I make a batch of the Basic Dough we discussed in Authentic Arabic Bread post, and leave it to rise. Now I can make my lunch! Am quite hungry by this time. Out comes the Panini grill. While it's heating I slice some Almond Cheese and Tomatoes, and wash a few Spinach leaves. I throw a handful of Kalamata olives in the blender with a large clove or garlic, some dry thyme and a dash of lemon. I turn on the blender for 3 seconds, drizzle 2 Tbs. of olive oil through top opening, and pulse it another 3 -4 seconds to blend everything. Two Gluten Free slices of bread are ready to be smothered in Tapenade, topped with Tomato, Spinach leaves and finally the Cheese. Top bread slice holds it all together. A light spray of Extra Virgin Olive Oil on each side of the sandwich, and onto the grill for about 3-4 minutes depending on heat of your panini maker. My green salad is already waiting and lunch is ready! Tart Cherries Invade Unsuspecting Brown Rice! A lovely blend of flavors, fit for a luncheon served with a grilled fish or lime glazed chicken breast. Keep some tart dried Cherries around for this impromptu dish. In a pinch you may substitute dried Cranberries. You may cook the Gaba rice in advance (like early morning) since it takes about 35 - 40 minutes, and leave pot out until you're ready to make the Pilaf. I always have pine nuts in my freezer for immediate availability. Put onion, celery, cherries, nuts, thyme, pepper and oil in a large skillet. Cook, uncovered, over medium heat 10 minutes, or until vegetables are tender; stir occasionally. Add rice; mix well. Cook 3 to 4 minutes, or until thoroughly heated. That's it, simple and scrumptious! Ok, so how in the world can these cupcakes be ok with our anti-cancer diet? Well, we've upped the fiber by adding chia and flax seeds, and used cocoa powder with antioxidants, replaced the sugar with Xylitol, and used olive oil for the friendly fat. I'm not saying you can sit down and eat 3 of these...but 1 cupcake is super ok! For an extra smudge of goodness: Melt 10 oz. 75% dark chocolate in a double boiler, add 1 Tbs. almond or soy milk and 1 packet Stevia. Stir well and smear on the cupcakes as they reach room temperature. Line a 12-c. cupcake pan with paper liners. Preheat oven to 350º F.
Add in the warm water (or tea or coffee), egg, chia seeds, oil, vanilla, and vinegar and beat until smooth. Beat for 2-3 minutes. Scoop the batter into the 12 lined muffin tin cups. Bake for about 15-20 minutes, until an inserted toothpick comes out clean. Remove the cupcakes to a wire rack and let cool completely.